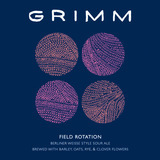 Created in collaboration with the team at Blue Hill, this refreshing Berliner Weisse is brewed as an ode to crop rotation. The historical tradition of rotating crops creates nutrient-rich growing conditions that produce the most flavorful grains and vegetables. Clover is a cover crop that nourishes the soil; oats and rye improve soil structure and suppress weeds; barley rids the field of fungus and pests. The ingredients in this beer both contribute to and result from the health of the whole farm. Brewed with malt grown in New York.